climb fast, and beat everyone on the World Cup circuit or local trails." Not that Jim is gunning to get on the World Cup circuit or even "beat" cyclists on local trails . . . but he did definitely need a lot better bike than the old Trek MTB he's owned for longer than he can remember. The Trek is history. Jim wasn't able to trade it in on his new Stumpjumper today since he didn't purchase it at the same bike shop but he will donate it for someone else to use. It still works, just not like a new 29er with much better components. Jim starts a test drive on his new bike. His old Trek and my TriCross are also visible. A new bike is A Really Good Thing at this point in Jim's life. He can't even walk for exercise right now, let alone run. The only aerobic activity he enjoys that doesn't hurt his bum knee is cycling. He's excited about his new toy and that alone should encourage him to increase the distances he's cycling. 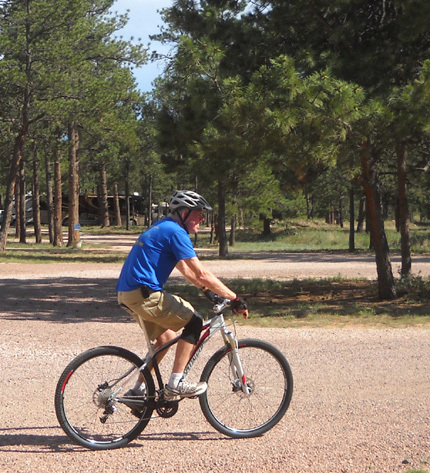 We have lots of good roads and trails in the Colorado Springs area to ride. Jim's been researching bikes off and on all summer. He held out hopes that his knee problem was only temporary and he'd be back running by now. It's clear that isn't going to happen, at least in the foreseeable future, so he's been doing a more diligent search online and at bike shops more recently. We're in a good area to purchase a bike. 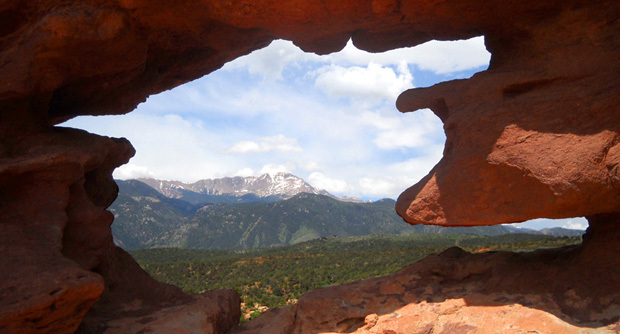 There are numerous bike shops in Colorado Springs and Denver; they are meccas for both road and trail cycling. 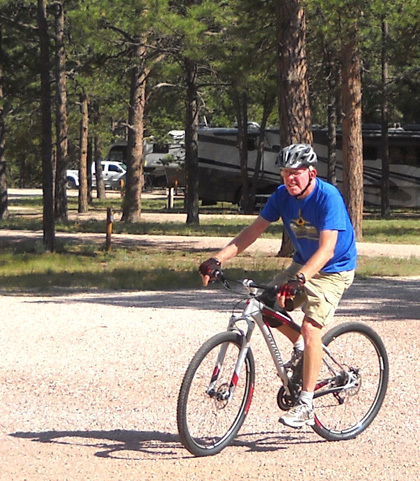 Jim was able to find a mountain bike he really likes at the best price here in the Springs at Pro Cycle. Reading about the various types of bikes (road, mountain, hybrid, cyclo-cross, etc.) and the plethora of features each brand and model claim is a different thing than actually getting on a bike and seeing how it handles. Jim was already one step ahead in this process because he knew he wanted the versatility of a mountain bike. He wanted something he could use on any surface and terrain we find in our travels, from pavement to rocky single track trail to sand. Although I love my Specialized TriCross cyclo-cross bike, Jim doesn't like it. He knew he wanted a beefier mountain bike with knobby tires and straight handlebars, a souped-up version of his old Trek. He zeroed in on the Stumpjumper models because they felt better than other comparable brands/models when he was test-riding them. He used the Stumpjumper as his base for comparison and they just didn't measure up to it. The Stumpjumper comes in about nine versions ranging from several lower end alloy-framed "Comp" models to pricey carbon-frame models. MSRPs range from $1,900 to $7,500 and up. Jim got one of the less expensive models today, the Stumpjumper Comp 29er, at a $200 discount at ProCycle. None of the other shops he contacted in Colorado Springs or Denver that carried the same model in the frame size and color he wanted (black, white, and red) could match that price. Jim's bike is a 2011 model. I think one reason the shop gave him a discount was to clear their inventory for new 2012 models coming out soon. The links I provide here for the Specialized website may change to reflect new models, new specs, and inevitable increased prices. Currently you can find the features, technical specifications, and geometry for Jim's Stumpjumper Comp 29er at this link, if you want details. This bike should serve Jim well for several years unless he decides to compete seriously and wants a lighter-weight carbon frame model with upgraded components. Meanwhile, this bike is so much lighter, more nimble, and has features that are so much better than his old MTB that he already feels like a champion! After Jim decided that the Stumpjumper "had his name on it" the shop mechanic checked it over thoroughly and adjusted it to fit him, taking measurements like the angle of his knees in different positions. The seat adjustment was fairly easy to determine and fortunately the handlebars are the right "reach." If they weren't, the shop would have swapped the front tube for another. Jim was encouraged to come back in for any further adjustments, if necessary. In addition to adjustments for riding comfort, new cables often loosen up in the first hundred miles and need to be tightened. He'll ride the heck out of it in the next week and take it back in before we leave the area if it needs tweaking. We also plan to come back in the fall. 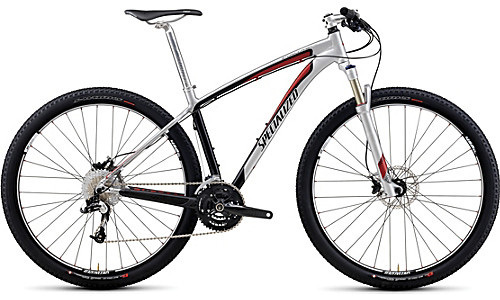 The frame is warranted by Specialized for a lifetime, the components for one year. ProCycle will perform a free tune-up if we bring the Stumpjumper back within a year (our favorite bike shop in Roanoke has the same deal with my TriCross). We'll do that if we visit Colorado Springs again next May. In addition to the $200 discount on the bike itself, one of the incentives the shop threw in to get us to spend more money was 15% off on accessories if we get them within the next week. Jim got a new helmet, gloves, shock pump, and tire pump. He may get some more items later, such as a second pair of padded shorts or new pedals. At Jim's request ProCycle left the basic, inexpensive pedals on the bike that they put on for test rides. They are similar to the ones he had on his old bike, after he took off the clipless ones he used for several years. They're just too hard to get out of in a hurry. Good bikes usually do not come with pedals because many buyers have specific preferences. If you look at Specialized website photo of the Stumpjumper above, you'll note that it doesn't show any pedals. Since Jim's knee got banged up last November when he was clipped into the Time pedals on my TriCross and he couldn't get his shoes out fast enough, he probably won't use the more expensive clip-in type of pedals any more (why they are called "clipless" pedals continues to baffle me)..
On the way back to the campground we stopped at the Academy BX to get a sturdier bike lock than Jim used on his Trek. Even a professional thief would have trouble cutting this sucker! 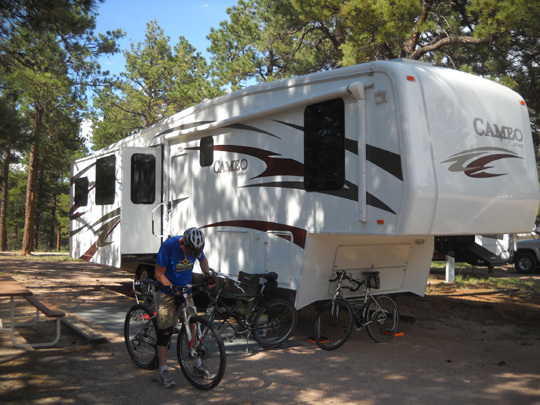 When we're camping we lock our bikes to the front or back of the 5th-wheel or a heavy picnic table. We used to travel with Jim's old bike locked to the ladder at the rear of the camper and kept the more expensive TriCross inside. 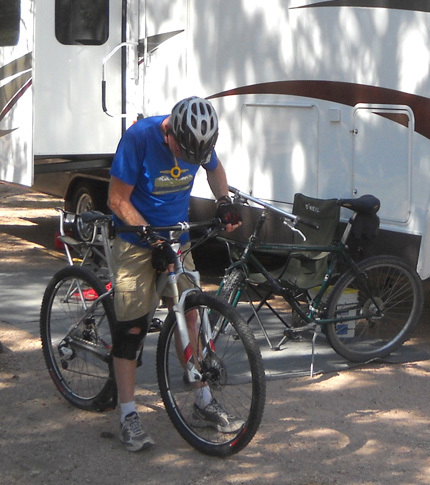 Now that he's got a better bike we'll put both bikes inside the RV when we're traveling from one place to another. 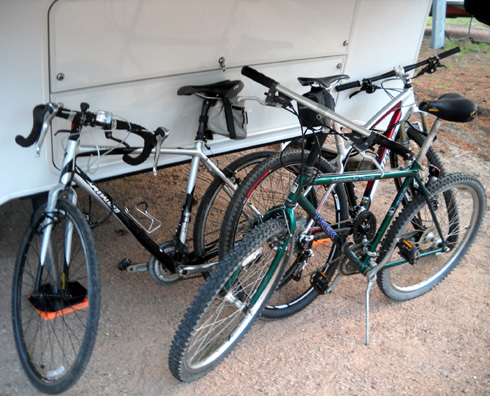 Even if we could find a suitable bike rack for the camper we prefer to keep these bikes out of the weather when we're on the road. Yikes, bikes!! We currently have four, including my road bike that's at our house. Jim plans to donate the Trek (green bike in foreground) in a couple days. Imagine how much fun this would be if I had my Terry road bike on trips, too! (Not.) It's a better bike than either the TriCross or Stumpjumper but can't be ridden on anything but pavement. Our Specialized bikes can go just about anywhere -- so the Terry sits in our garage when we're gone. Jim's a very happy boy right now. He's already read and listened to the information on the CD that came with his new bike, attached the pack and water cage from his old bike, and tested it out on the Academy grounds. He can't wait to go for a longer ride tomorrow. He loves this bike. I'm glad he is so enthusiastic about it.